The Mount Lavinia District judge was told today (October 31, 2014) in defamation case number 6036/08, known as the MIG Case, filed against Leader Publications (Pvt) Ltd by Gotabaya Rajapaksa, Secretary to the Ministry of Defence (and brother of President Mahinda Rajapaksa), that the new management of Leader Publications now wants to retain fresh counsel to defend the company. 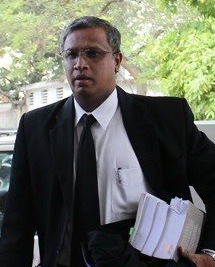 This development comes, after Rajapaksa was subjected to rigorous cross-examination for several days, by a team of lawyers headed by senior counsel M. A. Sumanthiran, on behalf of the Sunday Leader. The cross-examination is still not over. Colombo Telegraph has previously reported that journalists were prevented from observing and reporting on these court proceedings, by the military. The management change is as a result of a change of ownership in the Sunday Leader newspaper’s publisher, Leader Publications (Pvt) Ltd. The company is now bought over by interests represented by controversial businessman, Asanga Seneviratne who is widely believed to be close to the Rajapaksa regime. Some time ago, the counsel who appeared for the Sunday Leader against Rajapaksa to defend allegations of defamation were described as ‘traitors in black coats’ by the Defence Ministry website. This caused the Bar Association and others to protest and strongly condemn the attempt to interfere with the right of all to legal representation and due process. The item was removed from the site, thereafter. The court gave instructing attorney A. Ranagala who told court of the management decision, time to organize new counsel according to the wishes of the new management of Leader Publications.